Help with eBay purchase of a bad 2011 SDCC Green Lantern. 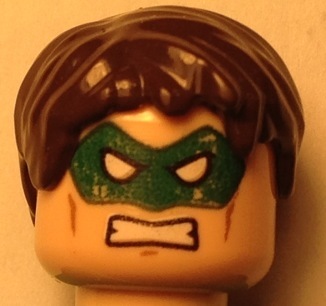 I don't know if I'm being too picky, but I just purchased a 2011 SDCC Green Lantern Minifigure off of eBay and the printing on the head looks horrific. I haven't seen very many to compare it too, but this looks bad. Also, the seller had a quantity of 2 listed. I think I got the one that wasn't pictured as well. Here the link to the auction for reference and also a pic of the one I received. He doesn't mention it being mint but also doesn't say it has flaws. He does however say it is brand new. So shouldn't I expect something brand new to not have flaws? Should I complain? Return for a refund or ask for a partial refund? If a partial refund, how much? My Ebay is not working for some reason so may I ask how much did you pay? Even without knowing how much you paid I would contact the seller with that picture (because I agree it looks horrific.) and explain how you were expecting a neatly printed Green Lantern. If you still would like to keep it ask for a partial refund. If you are not satisfied ask for the other he had or the full refund. If you paid $229 for that, I would get my money back. That is unacceptable condition. Yeah, don't stand for that. eBay will back you 95% of the time. You shouldn't have an issue. I'd try to see if the other one he has is in better shape. The only problem I see with this is since these were comic con exclusives and were so limited, they weren't all printed flawlessly. There is a good chance this is exactly how the guy got it and so it could be new. Someone on this forum mentioned getting a defective Bizarro from last comic con and contacted LEGO about it, but they couldn't do anything either. So not all of these were mint. Needless to say, he should have mentioned it in the auction. Yea if I was selling that I would have mentioned it in the listing. He had to know that whoever bought it would definitely notice that, paying that kind of money! Those scratches might be from the hair piece when turned around for other face. Hows the other face condition? Happened with my SDCC Phoenix, from eBay also. Seller didn't know and apologized, then sent a replacement one without card for free. So I think you should ask for same or at the very least a full refund with return. @Tevans333- Definitely return it. If you are going to pay $229 for a collectible that is described as MINT, then you better get MINT. Fading and some possible play wear on the face, is completely un-acceptable. Even if this is a limited edition item, and errors are more prominent, it still is not acceptable considering that there are actually MINT ones out there. If a seller describes it as mint, it better be :-) Or else! ^TC actually noted that the seller DIDN'T specify mint... but also didn't mention extremely noticeable gashes on the face. "He does however say it is brand new." Oh man, thats horrible. Ask for a full or partial refund, whatever youd be happy with. If it was me Id want a full refund. Seller didnt mention anything about the face being like that and the picture shows one with no damage at all. Thats a blatant mis-representation of what they were selling, IMO. If they dont give you what you want, file a claim with Paypal/Ebay right away. Id be fuming if I was in your shoes. It depends on the definition of "in great shape" (seller's words). Based on your picture though, it does not look like it is in great shape. Ask for full refund. If seller refuses file claim with PayPal. At that prices the minifigure should be perfect. Maybe he doesn't mind swapping it with the other one he "has". Thanks for the feedback everyone. I've been buying on ebay since the late 90's, and also off of Brinklink and trading off of various forums. After possibly thousands of transactions over almost 15 years, this is the first time I've had something arrive that I felt wasn't as described. I guess I've been very lucky to this point. I Just wanted to get a reality check and make sure I wasn't being overly sensitive. I've written the seller this morning and am hoping for a positive response from him. To be honest, I'm a bit surprised that you didn't ask for a better picture considering the price you paid. The one he posted looks like it almost could've come from anywhere. I'm sometimes a bit afraid of 'overly-annoying' the seller by asking for too many specifics and special requests, but when the stakes are this high, I say better safe than sorry. Between both eBay and Paypal it sounds like you should be able to get a refund, though. Best of luck. My guess is that the printing on these was not up to snuff, maybe because they made so few and didn't use the "tried and true" printing Lego normally does on their pieces, and it scratches off more easily. That, and because that's the "back" side of the face, it maybe was scratched by the hair going on (even once). Looking at http://www.brickset.com/minifigs/?m=sh001 the mask and mouth look a little "grainy" which might be on purpose, or because of the shoddy printing (which is again, pure speculation on my part). If that's the case, then this could indeed be mint, but maybe mint in this case was sucky from the start. Does the front face look ok? If the item was listed properly would you have paid that kindof money. If the answer is no send it back. You paid top dollar for a figure and you expect to receive items in tip top condition unless otherwise stated. When i sell sets on ebay i openly declare if there is and damage or mis prints. I'm happy to say the seller responded immediatly and took ownership of the issue. I asked them to propose a resolution and they gave two options. A complete refund including refund of original shipping and paid return shipping. He also offered $100 refund and to keep it. I thought both offers were generous and approriate right off the bat without any back and forth discussions. I took him up on the $100 refund and have already been refunded. I figure that makes the cost close to the value of it. I'll keep it as a place holder untill I find one I'm happy with, then I'll trade/sell this one (with full disclosure of condition of course:)). Thanks again for the second set of eyes and advise! He gave you a discount of $100? Wow. Things that make you go hmmm. I wonder if it's a counterfeit. It just seems weird for him to offer so much. Shrug. ^ Or possibly the seller knew this one had a major defect and knows it's not as valuable and just let it go for what he could get out of it. That's good to hear. Good for the seller to take responsibility and offer a fix. Just curious, are both faces damaged or just one? Upon closer examination of one that I personally own, I do notice some print bleeding on my angry face as well... the nuetral face looks fine. It may be a common problem.